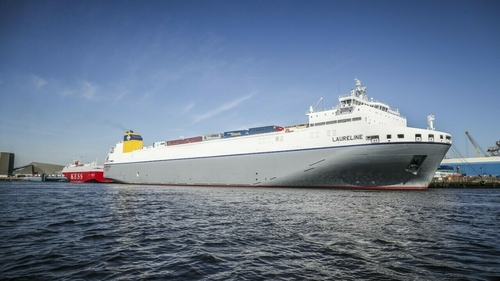 Dublin Port has announced that CLdN, the Luxembourg-based short-sea Ro-Ro shipping company and owner of the 'Brexit Buster' MV Celine, has added its newly built ship MV Laureline onto its direct Ro-Ro freight service from Dublin Port to the ports of Zeebrugge and Rotterdam. CEO of Dublin Port Eamonn O'Reilly said: "We're starting to see alternatives developing, options over the landbridge as people grow concerned about the issue". "We're starting to see more fast moving consumer goods which in the past would've been guaranteed access to the Irish market through the UK, we're now seeing a switch, these goods are coming directly to Dublin from continental Europe. "Those companies who don't need to use the UK are beginning to avail of those options, and make sure they have established commercial relationships to be able to move goods no matter what happens with Brexit. "The shipping industry can adapt very quickly, the one thing Brexit is not going to do, it's not going to increase the number of goods flowing in and out of Britain. "So if there are ships going in and out of Britain that don't have enough business, they can easily run in and out of Dublin. "The shipping industry can redeploy ships at very short notice to make up any shortfall, and respond to increase in demand. "The growth in Dublin port has been phenomenal. Over the last six years alone we've seen 36% growth, and we anticipate that demand for direct services between Dublin Port and continental Europe will increase further after Brexit." Today, the original "Brexit day", the MV Laureline left for the port of Zeebrugge in Belgium. The third in the fleet from the Luxembourg-based shipping company CLdN to service Dublin, the addition increases the company's capacity by 20%, bringing the possible number of sailings to seven a week. A spokesman for CLdN said: "We have taken a long-term view on Dublin Port and invested accordingly." The port says the addition of the "super ferry" is a vote of confidence in Irish ports amid the Brexit chaos. The firm said it was too late to cancel the extra crossings despite the UK's withdrawal from the EU being postponed. The controversial process put in place by the UK's Department for Transport has already seen a row over the collapse of the deal with Seaborne Freight, which had no ferries, and a £33m out-of-court settlement with Eurotunnel. It said in a statement: "As a consequence of increasing the frequency of sailings, we are committed to higher fuel costs. Our ships will sail an additional 2,000 nautical miles every week. We are also committed to higher port fees. "Fifty additional Brittany Ferries' port staff have been hired on both sides of the Channel to deal with more frequent port calls. We have also spent the last three months training current on-board teams. "The reality is that we were committed as soon as we signed the contract and preparations began to deliver the dedicated NHS shipment channel. There is no turning back at this late stage because all the preparatory work is now in place for March 29." The firm added that it is using its "best endeavours" to re-sell freight capacity unused by the Department for Transport, to reduce costs to the taxpayer. A British government spokeswoman said: "Leaving with a deal is still our priority, but as a responsible government it is only right that we push on with contingency measures. "The government's freight capacity contracts run for six months and are a vital part of wider contingency planning. They provide capacity for critical goods, including vital medicines, to continue to enter the UK in a no-deal scenario. "Due to the agreed extension until 12 April, tickets for the first two weeks have been released for sale on the open market, which will minimise costs for the taxpayer."